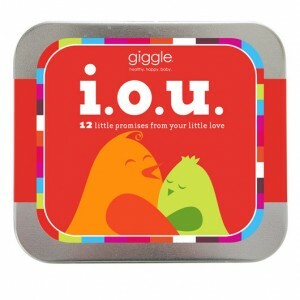 These IOU Promise Cards from Giggle make a great stocking stuffer! These fun and colorful cards allow you to keep on giving the entire year! As a mom we do A LOT so why not let your kids and husband OWE it to you from time to time! These promise cards will make kids feel like they are helping mommy and thanking you without even knowing it! I guess it’s kinda like Foced Appreciation! (LOL) And well husbands should be glad that there are only 12 cards, because I am sure all the wives could come up with a few more. IOU cards for a child with little promises like good for One Snuggle, One Clean Plate, 3 kisses, and Eat my Veggies! IOU cards for parents with little promises like Sleeping in , Diaper Duty, Friend’s Night Out, or Back Massage. Is it kind of silly that I like the kid IOUs more than the adult IOUs? I like the snuggles and hugs!! Thanks for checking out my blog! Isn’t that Disney volunteer incentive such a great idea?? Those are great. They just look super fun! I like those – My kids love to have these type of things and I love to receive Hug and Snuggles and doings chores is always a plus. My girls gave me a ‘coupon’ book a few years ago…filled with things like this. Hmmmm, time to redeem some, I think!